David Owen explores Hume's account of reason and its role in human understanding, seen in the context of other notable accounts by philosophers of the early modern period. Many of the most famous problems that Hume discusses, and many of the positions that he advocates, are expressed in terms of reason. It is central to his arguments about induction, belief, scepticism, the passions, and moral distinctions; to understand Hume's influential views on these matters, wemust understand what his view of reason is. The book begins with chapters on the theories of reasoning put forward by Hume's notable predecessors Descartes and Locke. Owen shows that Hume followed them in rejecting a formal, deductive account of inference, in favour of a new naturalistic account. But he went farther, in what we now call the argument concerning induction, by showing that no account of reason as a separate faculty could explain our inferences to beliefs in the unobserved. Hume offers instead an associationist account ofprobable reasoning and a new theory of belief. The picture of reason as an independent faculty is replaced with an explanation of reasoning in terms of properties of the imagination. 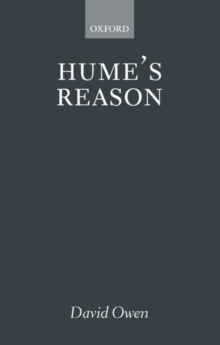 Hume's Reason offers a new interpretation of some of Hume's central ideas, and a treatment of reason which will be illuminating not just to historians of modern philosophy but to all philosophers who are concerned with the workings of human cognition.